When I told Ben I was Secretary to the Aberystwyth Bridge Congress, he formed a mental image of a happy group of Civil Engineers on their summer seaside holidays, discussing load bearing and suspension mechanisms. Maybe next year. The iniquitous PFI scam means that in order to book space in Ysgol Penweddig (yes, a Welsh medium school), you have to talk to a lady called Laura based in Mansfield. I've had to stay twice in Mansfield and I don't recommend it. Otherwise intelligent people find the clearest of forms simply impossible to complete. Otherwise punctual people find the word deadline simply impossible to understand. 450 packs of cards with attendant boards and packing cases weigh a lot. Bridge trophies are very ugly, although I thought Ciocia Magda's augmentation of the Aber silverware was a masterpiece (mistresspiece?). Suitably courteous letters to the local newspaper can extract sponsorship monies. Machines that will randomly [sic] deal umpteen hands of cards are devious torture instruments beyond Dante's imagination. An understanding of the WBF continuous VP scale will help. The WBU precept is 12.5%. Pinning the regalia on the WBU President is a bit like pinning the tail on the donkey, but it's perhaps best not to tell him that. The services of a mild-mannered Wizard are essential. The Swiss Teams algorithm is a joy to watch in action. Anyway, in the 1860s there were plans to build a viaduct from Ynyslas to Penhelyg, shortening the journey north from Aber by an hour or more. 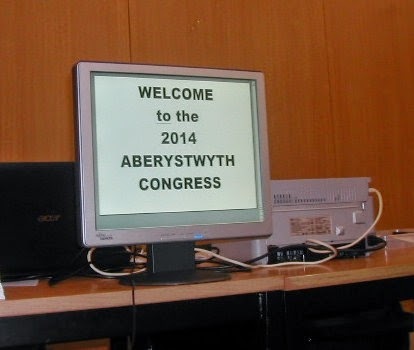 This crossing has been fictionally actualised in the celebrated works of Malcolm Pryce, but I am thinking the 2015 Aberystwyth Bridge Congress could do the job for real. It'd be more straightforward than this year's. (There are some indifferent photographs to be seen).